The United Nations Security Council should refer Myanmar to the International Criminal Court for investigations into accusation of genocide and other atrocity crimes against Rohingya Muslims, Fortify Rights said on Tuesday. The Security Council convened at the UN Headquarters in New York City for a briefing on the situation of the Rohingya on Tuesday. "It's not too late for the Security Council to respond with action," said Matthew Smith, CEO of Fortify Rights. "The civilian and military leadership in Myanmar are ensuring complete impunity for ongoing, heinous crimes, and that's precisely why international action is warranted and overdue." In response to violent assaults on security forces by the Arakan Rohingya Salvation Army in October 2016 and again in August 2017, the Myanmar Army led a brutal attack on the Rohingya civilian population, forcing more than 775,000 refugees to flee to Bangladesh and causing a humanitarian situation that UN Secretary General Gustavo Guterres described as "catastrophic." In a report published in November 2017, Fortify Rights and the United States Holocaust Memorial Museum documented Myanmar Army-led massacres, mass gang-rapes, and arson attacks against Rohingya since October 2016. Based primarily on hundreds of testimonies from eyewitnesses and survivors collected during a yearlong investigation since October 2016, the report found "mounting evidence" of genocide. On November 24, 2017, the UN special envoy on sexual violence Pramila Patten said the Myanmar Army's widespread use of sexual violence against Rohingya women and girls was "a calculated tool of terror aimed at the extermination and removal of the Rohingya as a group," adding that she, too, documented the basis for characterizing the crimes as genocide. In a statement during a Special Session of the Human Rights Council on December 5, 2017, the UN High Commissioner for Human Rights Zeid Ra'ad al-Hussein referred to the crime of genocide with regard to the attack on Rohingya, saying, "[C]an anyone rule out that elements of genocide may be present?" In a BBC film that aired later that month, High Commissioner Zeid said that members of the military as well as the civilian government in the country may be liable for genocide. More recently, at a press conference on February 1, UN Special Rapporteur Yanghee Lee said the situation of Rohingya in Myanmar "bears the hallmarks of genocide." In 2015, a legal analysis prepared for Fortify Rights by the Allard K. Lowenstein International Human Rights Clinic at Yale Law School found "strong evidence" that the government of Myanmar was responsible for genocide against Rohingya Muslims. "Understanding the crime of genocide is not the exclusive domain of international courts," said Matthew Smith. "If we can ever hope to prevent genocide, we have to be able to diagnose it when we see it. Enough is enough. It's time to stop tip-toeing around terminology and move towards holding perpetrators accountable." The governments of Bangladesh and Myanmar have recently made preparations to repatriate Rohingya refugees back to northern Rakhine State, Myanmar. The governments did not consult Rohingya or the UN High Commissioner for Refugees about the plan, it said. 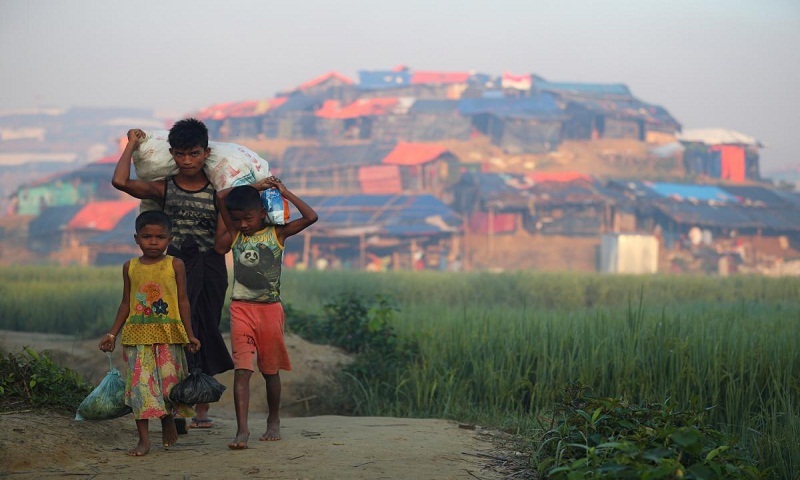 Donor governments and humanitarian agencies should not support the repatriation of Rohingya refugees to Myanmar under the current conditions, Fortify Rights said. Donor governments and the UN should instead ensure that any repatriation in the future is voluntary, safe, and dignified in accordance with international standards. Rohingya families continue to arrive in Bangladesh, fleeing persecution and ongoing human rights violations in Myanmar. The Myanmar authorities also continue to confine more than 120,000 Rohingya to dozens of internment camps in eight townships of Rakhine State-mostly survivors of violent attacks in 2012-while denying all Rohingya in Rakhine State equal access to citizenship, marriage, education, and employment and systematically restricting their freedom of movement. The authorities also continue to deny the existence of Rohingya. Since August 2017, the Government of Myanmar has denied lifesaving humanitarian aid to tens of thousands of Rohingya in need, particularly in the three townships of northern Rakhine State-Maungdaw, Buthidaung, and Rathedaung townships-creating conditions of life designed to be destructive, Fortify Rights said. The UN Security Council met in September and again in December 2017 to discuss the Rohingya crisis, failing each time to issue action-oriented resolutions. In addition to a referral to the International Criminal Court, the Security Council should also implement a global arms embargo on Myanmar and targeted sanctions against those responsible for mass atrocity crimes, Fortify Rights said. "The inexcusable international response to this crisis borders on complicity," said Matthew Smith. "The Myanmar authorities took their cues from international inaction and committed several rounds of mass atrocities. We can't let this continue."